These cookies have been a family tradition for Christmas as long as I can remember. They are my father's favorite and both my parents now make these cookies together. They are a long involved process but worth it in the end. Don't let the amount of ingredients scare you, or the fact that you are using Potash and Baking Ammonia for making these. You will likely find these ingredients at a German specialty shop. Don't bother explaining what you are looking for in your local grocers, they will think you are off your rocker wanting to cook with Potash and Ammonia. In Winnipeg where I live you can find it at Market Place on Henderson Highway, or the Bake Oven on Edison Ave. (Try to read the recipe with a German Accent ;o) it is written the way my mom told it to me). Mix all ingredients well with a wooden spoon. Add 4 -5 cups of flour again after dough is well mixed, total amount about 11 cups of flour. Dough is now even firmer. Let stand in refrigerator for 2 hours, knead well again. Roll out on to floured counter and cut into circles. Bake at 325 for 7-10 minutes. Cook all ingredients including the egg white over a double boiler and beat for 5 - 7 minutes. Icing it will be ready when it spins like a thread. 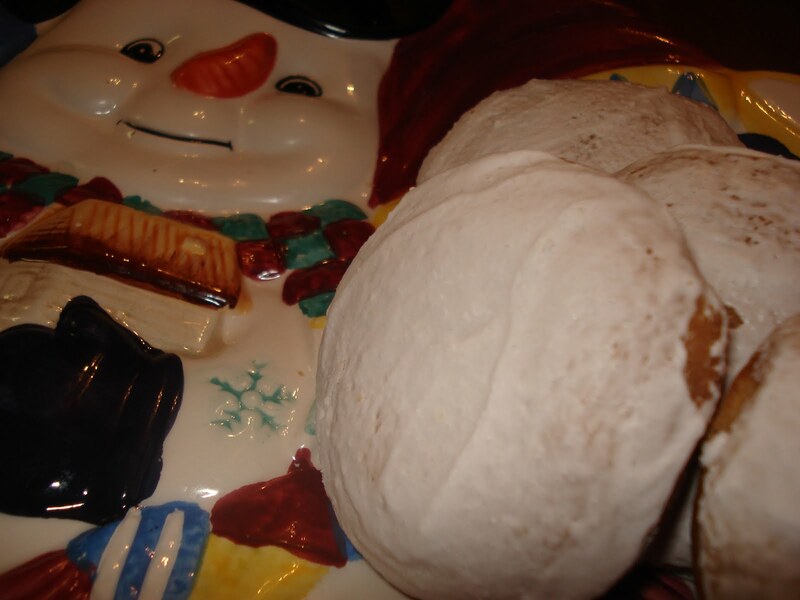 1 1/2 cups of sifted icing sugar, don't cook and schmear over cookie. I'm delighted to see recipes using baker's ammonia. My husband is on a low-sodium diet and, unlike baking powder and baking soda, the baker's ammonia is sodium free! So the recipe calls for 10-11 cups flour total? Confused. I would venture a guess that most international markets carry the potash and ammonia. yes that is right. a total of about 11 cups of flour. Glad one of you good cooks lives in Winnipeg so that I am now steered in the right direction for the baking ammonia. I made the peppermint cookies substituting with double baking soda and was happy with the results but didn't feel they had the identical texture. Never heard of using potash in any recipe, however. I guess I'll have to head to North Kildonan to shop. I was going to try them but this saves me a possible wasted trip. My Oma still makes these but calls them honey cookies. This recipe takes me back to grandma's kitchen! Thanks for sharing. Heidi, sorry I don't know where in Abbotsford you can buy it, but in Wpg, it is sold with the baking ammonia. Sorry Lois, yes it would be about 11 cups total of flour. Winding Ways, that is interesting information. I never knew that it was sodium free, good to know. 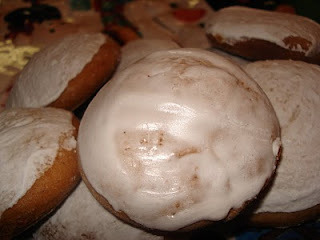 I just posted about my lebkuchen and then I see your recipe of the day is also lebkuchen! Yours look very "lecker"! I grew up in Winnipeg, though I now live in Arizona, I miss my home town at Christmas. My mother's dear friend was Mennonite and I remember these cookies with great fondness. They are worth all of the effort! I love your blog and have enjoyed trying the recipes. Thank you for a trip down memory lane! Found out that you can get both baking ammonia and baking potash at The Bake Oven in North Kildonan on Edison Ave. 204-338-0663. Charlotte, for the frosting do you cook all of the ingredients together.. with the egg white? yes anneliese, we cook it all together, but i suppose there are other ways of doing it too. I am so thrilled that you posted this. I have only ever had it "stor boughten." I love Lebkuchen and will be happy to try the recipe this Christmas. Oh no! I surely won't be able to find potash and baking ammonia here. Please send two dozen to Montana! These are quite similar to a recipe that my Grandma used to make, but I don't recall hers ever having citrus in it. She doesn't bake much anymore now, but I sure do miss these cookies. Silly Mennonites...baking with baking ammonia & potash...sheesh! If you are looking for Potashe and Baker's Ammonia (also called Hartshorn) as well as other German spice mixes (Lebkuchen, Honey Cake, ground Anise, etc): Edelweiss Imports in Canada (they mail order) and House on the Hill & King Arthur Flour (Baker's Ammonia only) in the USA. You can substitute baking soda & baking powder for these 2 ingredients but the cookies will not have the same crispness. Which frosting did you use in your photo? I'm making these today. Hope to start a yearly tradition that reminds me of my own childhood. Hi Kim, Good question, it mean one lemon zested. I will change the way it is listed to make it easier to understand. Thanks for pointing it out.